Lal Thanzara, the Mizoram minister who stepped down from the government, might be following the time-tested strategy followed by Indian politicians. Last Monday, when allegations of conflict of interest forced Mizoram minister Lal Thanzara to resign from the state cabinet and assembly, there was much excitement in the state. However, the excitement might prove short-lived as the minister could return to the cabinet soon, making this yet another case that slipped through the cracks of India's anti-corruption framework. As Scroll reported in June, between 2009 and 2012, Lal Thanzara, who is the brother of Mizoram Chief Minister Lal Thanhawla, held shares in a company getting road contracts from the state government. This created a conflict of interest where Lal Thanhawla's government was giving contracts to a company part-owned by his brother. Shortly afterwards, it also emerged that HP Food Products, a company first owned by Lal Thanzara and then by his son, had supplied high-protein biscuits to the state government between 2010 and 2014. Activist Laltanpuia Pachuau pointed out that this was a violation of the Representation of People's Act, 1951, which forbids elected representatives from entering into trade and business contracts with the government. As pressure on the ruling Congress mounted, Lal Thanzara stepped down on Monday, insisting he was innocent. However, a news report published two days later in the Indian Express suggests this resignation might have been tactical. 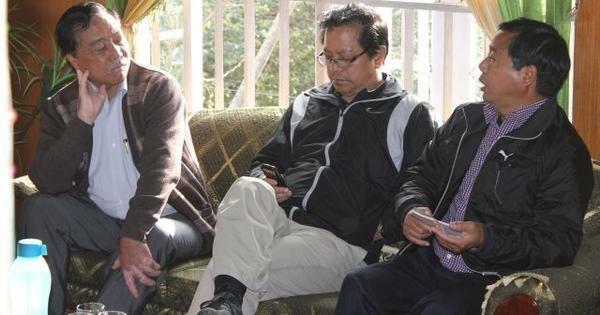 Speaking to reporters in Aizawl, Chief Minister Lal Thanhawla and his colleagues backed Lal Thanzara's credulity-straining claim that he did not know he had shares in Sunshine Overseas, the road construction company. As for HP Food Products, they said the company is owned by Lal Thanzara's son, not Lal Thanzara. They also said that HP Food Products is the only company which makes 'high protein' biscuits in the state. More significantly, the party leadership, reported the Indian Express , “hinted Lal Thanzara will contest a bye-election for the seat he has vacated, Aizawl North 3". These statements show a sharp understanding of the frailties of India's anti-political corruption machinery. Take HP Food Products. By saying Lal Thanzara's son owns the company, the Mizoram government is claiming there is no illegality as the Representation of People's Act of 1951 prohibits elected officials from getting into contracts with the government, not their family members. The affidavit filed by Lal Thanzara in 2008, declaring his assets before the state polls, lists HP Food Products as one of his companies. The next affidavit, filed for the 2013 polls, does not. It is not clear when the company's ownership changed hands. Questions sent by Scroll on Friday to Lal Thanzara asking when the ownership was transferred did not get a response. If the company's ownership changed after 2010, then even with India's restrictive definition of conflict of interest, there is a violation of the Representation of People's Act. If found guilty by the Election Commission, which oversees the implementation of the Act, Lal Thanzara would be disqualified from contesting elections for the next six years, said Jagdeep Chhokar, one of the founders of the Association for Democratic Reforms, a non-governmental organisation fighting for cleaner politics. This might explain why Lal Thanzara resigned the day Pachuau submitted his complaint to the Election Commission – he was trying to ward off possible action by the Commission. The other law at work here is India's Prevention of Corruption Act. Suppose HP Food Products' ownership had changed before the company began supplying 'high protein' biscuits to the Mizoram government, that creates an outcome – as in the case of the road construction company – where a government headed by Lal Thanhawla gave contracts to companies owned by his family members. In their defence, the Congress leaders said at the press conference that HP Food Products got the contract because it is the only company in Mizoram which makes these biscuits. This is where the third loophole reveals itself. To establish wrongdoing, an investigation has to be ordered. This is carried out by the state police's vigilance or anti-corruption wing which, however, reports to the state government. “In our present system, the state government has to sanction an investigation,” said Bhushan. In Mizoram, what further complicates matters is that the vigilance function is handled by Lal Thanhawla. Scroll's questionnaire on Friday asking Lal Thanhawla if an investigation had been ordered into these accusations went unacknowledged. The need to have an independent investigator underpinned the movement for a Lokpal, said Bhushan. The government cannot be expected to investigate corruption charges against itself. In the absence of a Lokpal, said Bhushan, the only recourse is the judiciary. “Someone will have to move the courts seeking an investigation into all this." However, the courts are not much of a panacea either – loophole number four. Several cases never get concluded. "The cases stay pending. If the courts decide, one can come to the Supreme Court. But often you are just stuck in the High Court," he said. There is a precedent within Mizoram of an anti-corruption case fizzling out. It involved Lal Thanhawla and another road-construction company, ABCI, headquartered in Silchar. This case against the chief minister, along with another one involving corruption in hydel projects, was eventually heard in Aizawl by a special judge under the Prevention of Corruption Act. By 2010, the judge had dismissed both cases. “I wish sometimes that I had appealed further. But my partner, Rev Zairema, had died," said Bualhranga. He himself was ageing. Others in the state did not appeal against the order. That is how the cookie crumbles. It remains to be seen whether the Election Commission will take action on Pachuau's complaint. Or the courts will order an enquiry against him. If not, it is possible that Lal Thanzara will stand in the bypolls, win and return to the assembly and the government. The only ones who can stop him are the voters of Aizawl North 3.